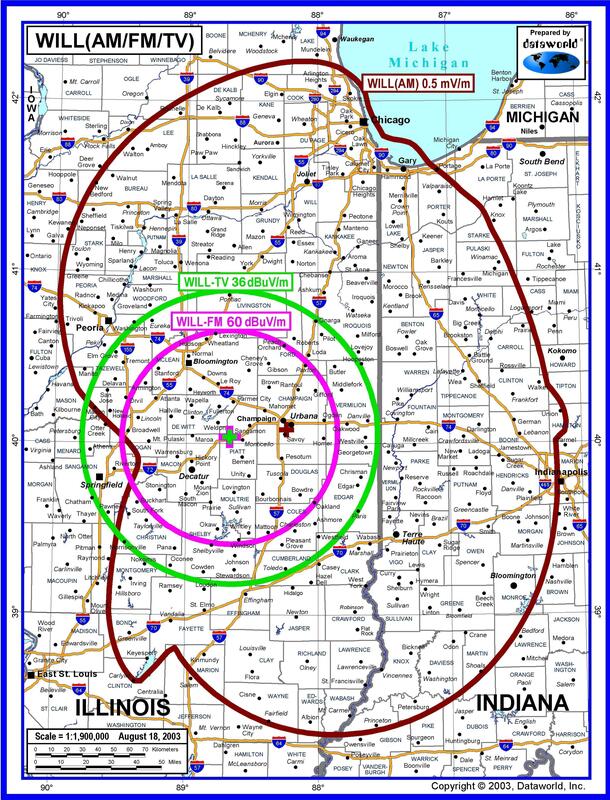 The broadcast signals on WILL-TV and WILL-FM cover most of central Illinois. WILL-AM reaches most of Illinois and a significant portion of western Indiana. Here are technical details about our stations, and information about our Engineering Staff. 3. Nighttime, which allows it to operate at a power level of 100 Watts after the post-sunset period ends and until pre-sunrise or daytime operation begins. Get the detailed WILL-AM Transmitter Power Schedule here. All power levels use the same directional antenna pattern, which is cardioid (heart-shaped), with a minimum toward WIBW in Topeka, Kansas, which is the primary station WILL is required to protect from interference. which is located on the University of Illinois South Farms, about a mile south of the Assembly Hall in Champaign, IL. Main Transmitter is a solid state Broadcast Electronics AM-6A. Backup transmitter is a Gates Five (FET output devices). Audio processor/modulation controller is an Orban 9100A/1 monaural unit with NRSC filter. Dielectric DCR-C12, 12 bays in radomes, circularly polarized, side-mounted at the 850 foot level of a 1047 foot tower. The WILL-TV antenna is the top 122 feet of the structure. The 60 dBuV/m coverage area is a circle of radius 43.1 miles around the antenna. Main transmitter is a 25 KW Broadcast Electronics FMi 25T(4CX20000C output tube). Backup transmitter is a 20 KW Broadcast Electronics FM20B(4CX12000A output tube). Audio processor/modulation controller is an Orban 8500 HD. WILL-FM operates a translator to improve the signal in Urbana, IL, with output on 101.1 MHz. The Urbana antenna, which is located at 1108 Main, is 185 feet high with an ERP of 250 Watts. Our transmitter is a Harris Solid State PTCD10P1 capable of 3.5 KW average digital power. 5 miles West of Monticello Illinois and one mile North of Interstate 72 or 40 degrees 02 min 18 sec North Latitude and 88 degrees 40 min 10 sec West Longitude. Total tower and antenna height 1047 feet. Antenna is a Dielectric TF-12HT-DC-S. 36 dBuV/m coverage is a 61 mile radius from transmitter.